“All I Really Need Is Love” featuring Priscilla Badhwar, Fred Badhwar (le chat), and Steve Marcum. Filmed in Austin, Texas by Lumen Media. Surrounded by art, dance, and music, Priscilla Badhwar grew up in Houston, Texas. She moved to Austin and attained her Bachelor of Arts in Music from The University of Texas at Austin. However, she did not stop there, though, putting her head down, working hard, and attaining a Doctor of Pharmacy degree from The University of Texas at Austin College of Pharmacy. Over the years, she has developed a love for Brazilian and French jazz music. Her influences include the remarkable Blossom Dearie and the incomparable Henri Salvador. Of course, she cannot exclude the influences of artists such as Ella Fitzgerald, Julie London, Frank Sinatra, Diana Krall, Madeline Peyroux, and so many more musical legends. Priscilla is vivacious, witty, and intelligent. Sometimes she is playful or quirky while other times wholesome and compassionate. Her character and versatility comes through in her singing. She currently resides in Austin, Texas. She has worked with many esteemed artists in Austin including: Suzi Stern, Eddy Hobizal, David Pulkingham, Steve Schwelling, and Daniel Durham. Mademoiselle is a French Jazz Recording with a bit of a twist. The album contains six tracks that are comprised of works made popular by artists such as: Henri Salvador, Blossom Dearie, Charles Trenet, and Salvadore Poe. Most of the songs are in French and are filled with colors and textures from around the world. 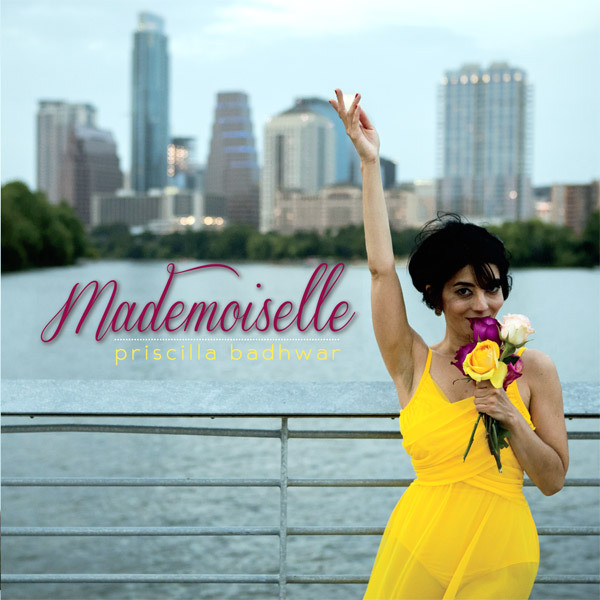 Mademoiselle delivers everything from uplifting swing tunes to sultry bossa nova grooves. “Jardin d’hiver,” the third track, is especially ethereal and haunting with a sultry bossa nova rhythm. Austin’s finest musicians including: Eddy Hobizal, David Pulkingham, Steve Schwelling, and Daniel Durham can be heard on this unique French Jazz Recording. Contact Priscilla or Book a Gig! Copyright © Priscilla Badhwar. All Rights Reserved.